They warned us Jonas was coming. 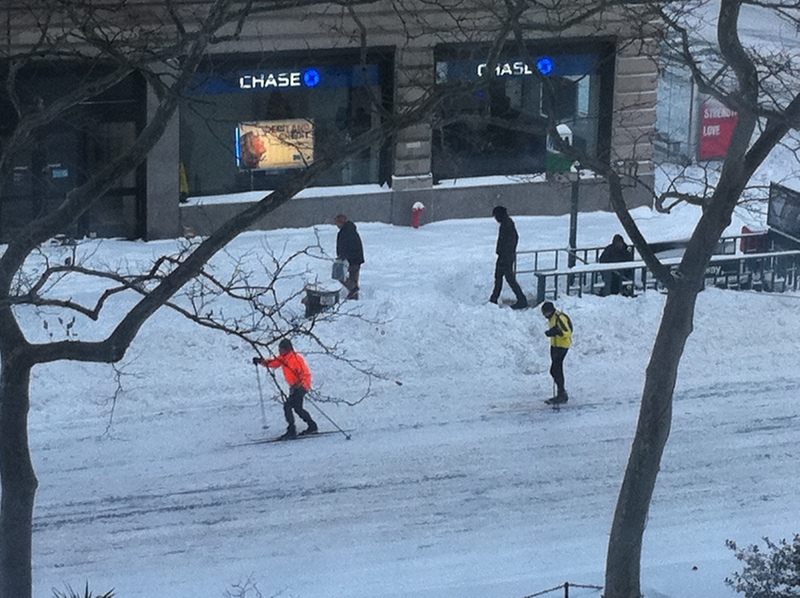 In predictable NYC fashion people rushed to the local supermarkets and cleared the shelves of bread. One can only hope that wine and cheese were bought too. We all speculated, would the city really get hit this time? 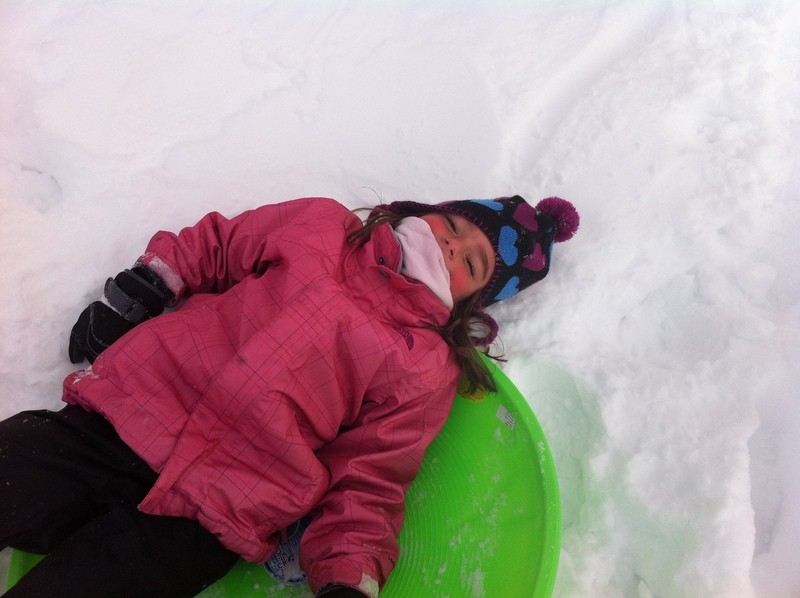 Last year in preparation for an epic storm, the subways were closed, schools were cancelled and not a single flake fell. Bummer. This time, storm Jonas actually went above and beyond and brought more snow than was even predicted. 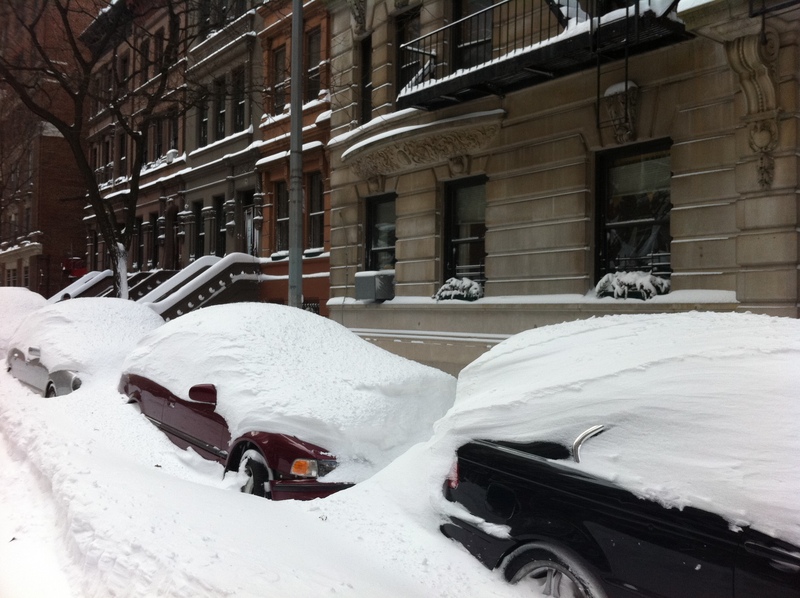 It was a record storm for NYC, one for the books. 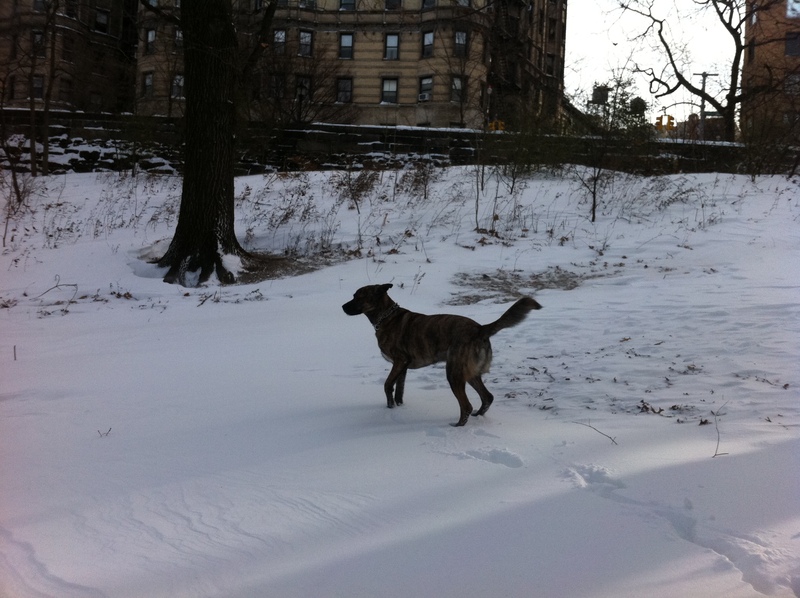 The Jonas snowfall total for Central Park is 27.9 inches. Wowza. We spent Jonas hunkered down in the apartment. I caught up on tv shows and ventured out to take the dog and grab a few pics. The girls played with friends and tuned into their own devices. We found some of grandma’s spaghetti sauce in the freezer and indulged in gourmet hot chocolate given to us as a Christmas gift. The snow fell outside, the wind blew and I felt incredibly grateful to be warm and safe inside. Caught in our own little winter wonderland snow globe. I love when NYC is forced to slow down. 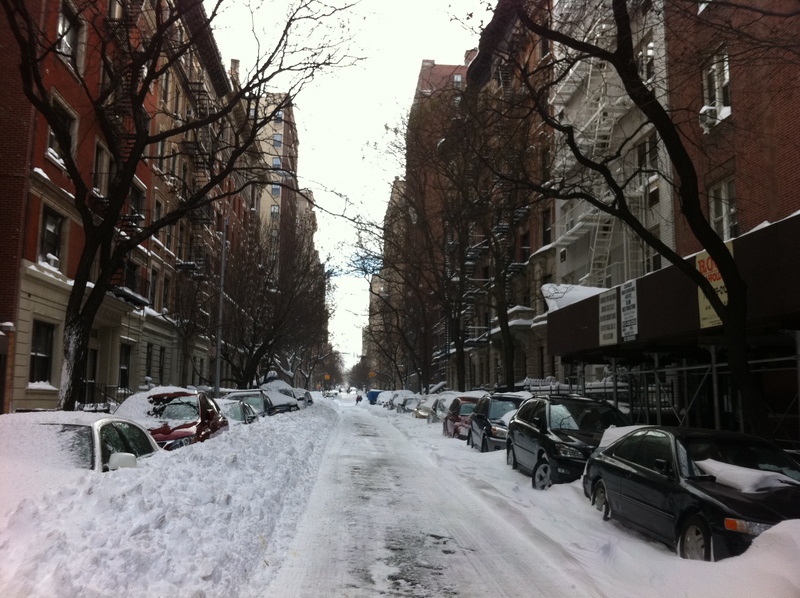 The streets clear, people reach out to help others, small acts of kindness are witnessed- a shared meal, a sidewalk shoveled, a hand up over a large snowbank… People gather on the deserted streets to take in the beauty of the freshly fallen snow. We remember to cherish the little things. 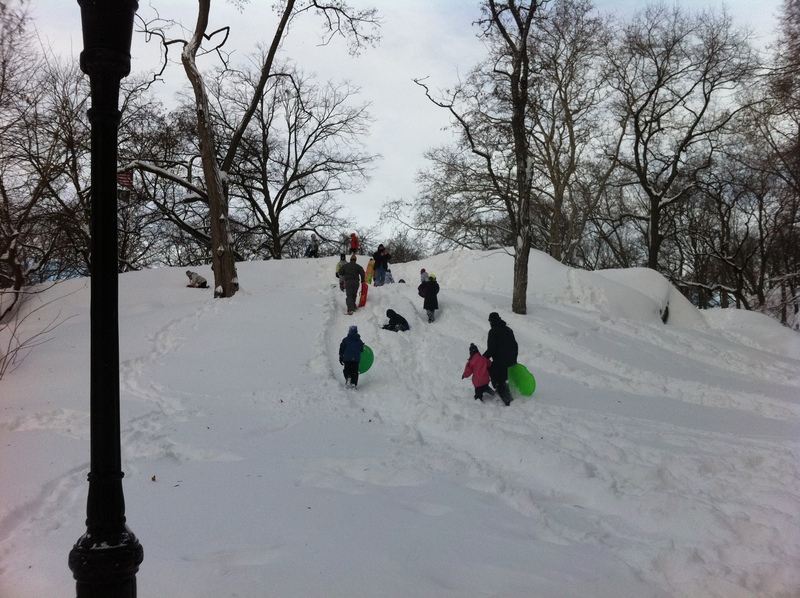 This morning we headed over to our favorite hill to get our sledding on. The sun dazzled, kids laughed and the city slowly awoke, seemingly a bit reluctant to return to its normal pace. The City That Loves The Snow! We don’t get a lot of snow days here in Manhattan. If we are lucky we get one huge snow dump a year. The kind of storm that forces everyone to slow down, chill and wait it out. And, if you have no where to go, you can’t help but be a little bit excited about it. This is what happened yesterday. 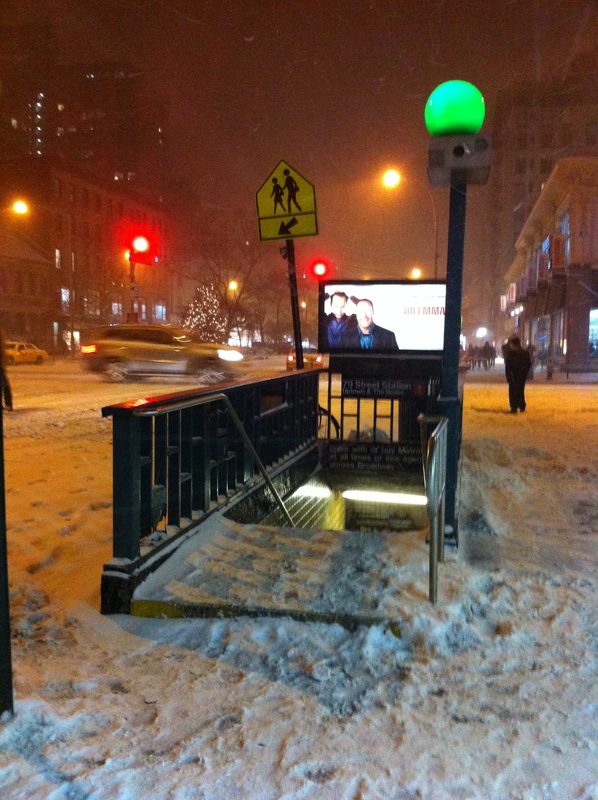 A big Nor’easter blew in and Manhattanites fled inside to escape the snow and wind blowing through the city. We hunkered down, played games, read books and watched some t.v. It was all warm and cozy. Heavenly. After a wonderful, relaxing Christmas day with the family, almost if on cue, (a day late) a winter storm started to roll into the East Coast. In typical New York fashion, the first snowfall of the year was not going to be a small affair and the winter storm watch quickly turned into a full blown blizzard warning. There was much excitement in our apartment. I think we were all just a wee bit sad that there was no snow for Christmas and we were super psyched to finally experience our first snowfall in Manhattan. As the first snowflake hit the ground, the girls began to panic as the crazy carpets had not made it with us in the move. Grandma saved the day by going out to our local sports store and scooping up two magic saucers. 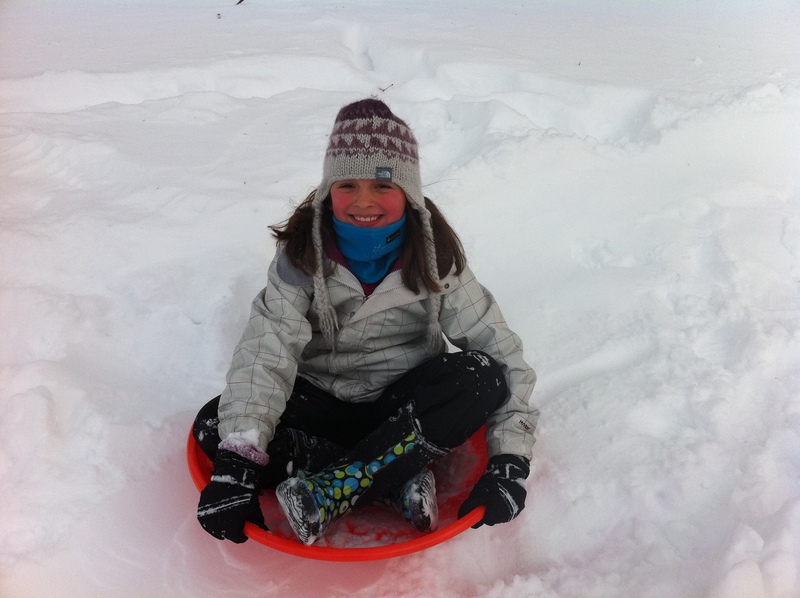 Impatience set in and the girls wanted to head to the park even though there was not nearly enough snow yet for downhill fun. Out we went, the wind was howling and the snow was already gusting sideways as we made our way down to Riverside Park. We passed many Manhattanites who were making last minute purchases at the grocery and liquor stores, stocking up for the impending storm. 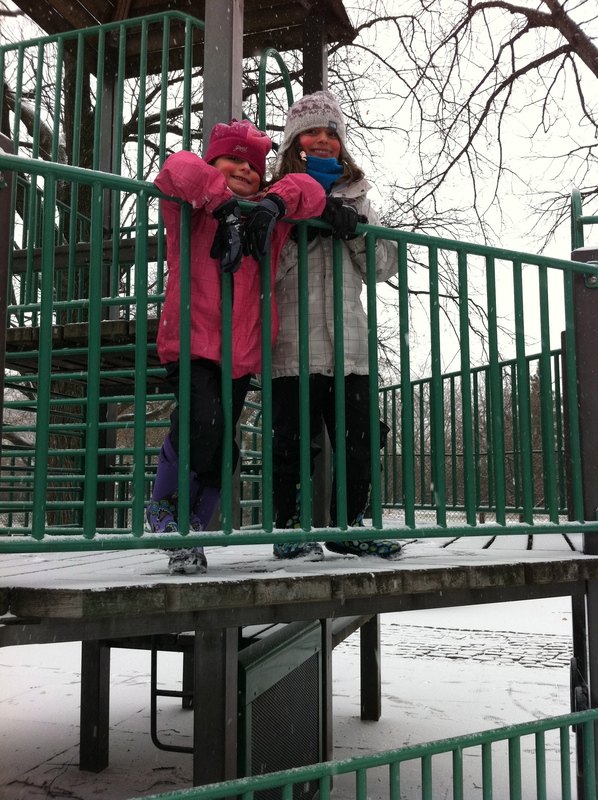 Our hearty Canadian girls were the only ones brave enough to endure the wintery park conditions!! Funny, although New York City is located in the state of New York, which definitely gets its share of winter weather, many people in Manhattan seem ill prepared to deal with ACTUAL winter weather. We passed numerous people whose only defence against the elements were rainboots, ball caps and layered clothing. Of course, we did see many lavish fur coat/hat/boot combos as well. The umbrellas also come out here… something that you would NEVER see in Ottawa. Don’t even get me started on dog coats!! There really is something truly magical about the falling snow and I forced both Paul and Ron off of the couch and made them go for a walk last night. There was barely anyone on the streets, car or pedestrian and it was extremely peaceful navigating the snow filled avenues. The city itself looks totally different covered in snow and there was a sense of calm that is rare to find during the crazy daylight hours. 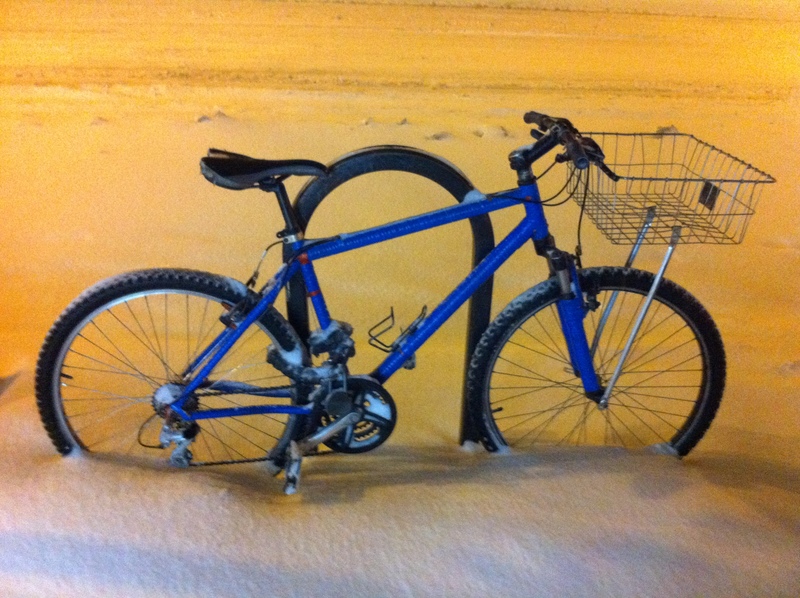 Even in a blizzard, the bike guys are still delivering- CRAZY!! After a surprisingly quiet night (very few sirens or anything else going on) we woke up to a true winter wonderland in Manhattan. No early morning joggers, although a few adventurous types were trying to get in some exercise! The streets and sidewalks were barely passable and 20+ inches of snow had fallen, virtually shutting down the city and its surrounding boroughs. 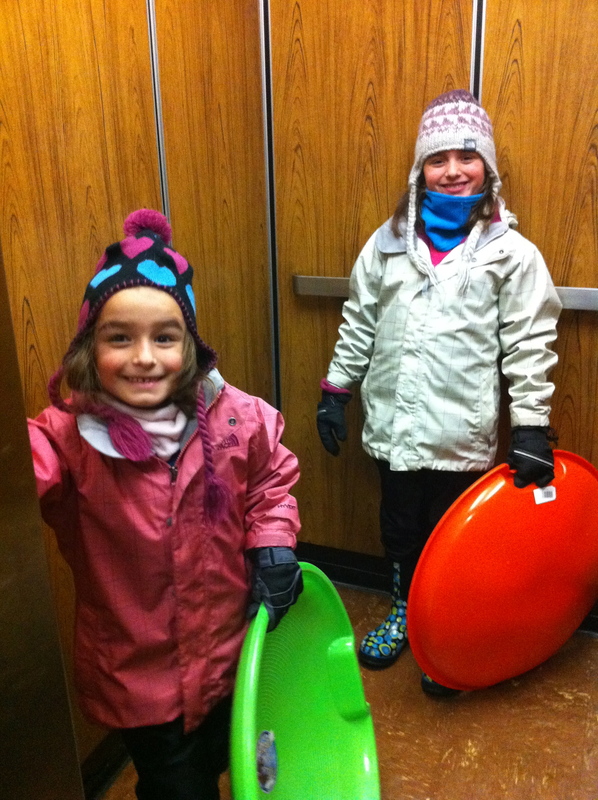 The girls were ecstatic and immediately demanded that we bundle up and head out to find a hill to try out sledding in New York City. Out we went, the wind was howling but we were determined. We lasted 30 minutes but the girls had a blast and we all enjoyed a bit of Starbucks on the walk home. VERY glad we don't have a car! !